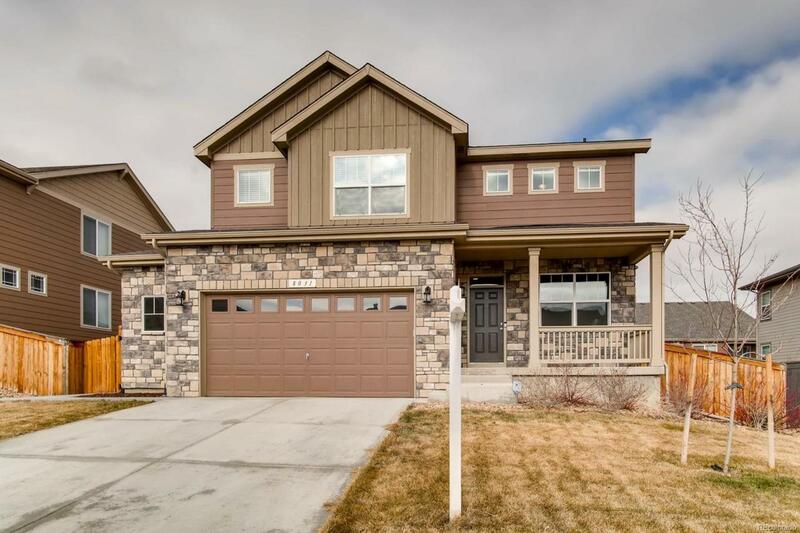 This home is move in ready featuring 4 bedrooms and 3 full bathrooms upstairs. The main level features a formal living and dining room with wainscoting and new hard surface flooring. Beyond the formal spaces this home has a huge family room with a fireplace that is large enough for multiple furniture configurations. The kitchen features beautiful backsplash, stainless appliances, and double ovens! All of the upper level bathrooms have tile, the laundry room is located upstairs and has a utility sink with tons of storage, which isnt always found in this floor plan in the neighborhood. Outside there is an extended patio and a gas value for a grill or heater, perfect for enjoying Colorados 300 days of sunshine! The neighborhood has two parks within walking distance and there is no metro district, so taxes are much lower than the other newer surrounding neighborhoods. This home was hardly lived in and includes all kitchen appliances and Samsung washer and dryer! Make this one yours!